Professional fiddler, teacher, and performing artist Megan Lynch Chowning took up the violin when she was four years old. By the age of eight, she had won the nation’s premier fiddle contest, known worldwide among fiddlers simply as Weiser (the National Old-Time Fiddlers Contest, held in Weiser, Idaho). Originally from Redding, California, the six-time National Fiddle Champion and winner of countless other national and worldwide competitions came up during a time when contests were all the rage and genre lines were beginning to blur. She has strong feelings about each phenomenon. 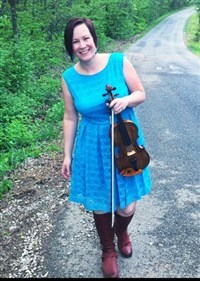 On style, Megan says, “Fiddlers, you can do all of those genres.” Teaching by example, she has made a career of playing and teaching any number of fiddle styles from folk to country to Celtic to old time to Motown and back again. An active member of the bluegrass scene, Megan has played with Dale Ann Bradley, Roland White, Larry Cordle, Jim Hurst, Chris Jones, Chris Stuart, and others. She has toured with legendary country artists, too, including a recent four-year stint with Pam Tillis and Lorrie Morgan. Chris Stuart of Chris Stuart & Backcountry comments on what sets Megan apart. “What makes Megan unique among even professional fiddlers is her ability to handle anything that is thrown at her,” says Stuart. “She’s going to play appropriately to the song while making it sparkle. As a bandleader and songwriter, I can relax on stage and enjoy her playing as much as the audience does. Fiddler Magazine caught up with Megan during a rare moment of downtime between tours and camps. Despite her busy schedule, the respected teacher was eager to share her perspective on teaching and learning fiddle in today’s environment. You recently won the Grand Master Fiddler Championship (Traditional Division). How do you approach contest fiddling in your own students? As teachers, we need to be against only going to contests to succeed. At the same time, we don’t want to shortchange contest fiddlers. Kimber Ludiker is a perfect example of great versatility being possible among fiddlers. She is one of the finest contest fiddlers, yet is running and playing fiddle in one of the most successful bluegrass bands today (Della Mae). Many posit that “contest fiddlers” all sound the same and lack a unique musical vision. That could not be farther from the truth. Some will perform as a living, some more on the side of another career choice. My student Grant Smith is making his mark in the original blues and rock world and is just in his early high school years. Another, Cara DiGiovanni, is a successful contest fiddler as well as an upcoming star in the bluegrass world. To help my own students avoid fiddling themselves into a neat, sterile contest-fiddling-only box, I expanded my teaching to include everything that there is to teach. I don’t rest until they can chart the chords to their tunes, play a killer “Dusty Miller,” and learn an old time tune on the fly. You direct a variety of music camps from your home, namely your FiddleStar Youth and Adult Fiddle Camps. Tell us why you do it, and what can we expect from current and future camps? Camps are about “doing” what you learn. You cannot get better… you will not become a musician unless it becomes part of your community. The best thing that can happen for me is that “Joe Smith” and “Bob Brown” come to my camp and connect as friends and musicians. I held my first camp in 2008. Over the years, we’ve added more camps and more ideas! My talented husband, Adam, and I just completed a brand new camp (January 2015) that focused on the fiddle/banjo duet concept. Clawhammer banjo virtuoso Adam Hurt and I (with champion fiddler and banjoist Tyler Andal) taught the camp, which consisted of five fiddlers and five banjo players, paired in duet fashion, learning how to make incredible banjo/fiddle music together. I suspect that some of our camps will go this direction – smaller numbers, more honed topics. In 2015, we plan to host two adult fiddle camps as well as our youth fiddle and guitar camp, plus flatpick guitar, mandolin, songwriter, and clawhammer banjo camps. As for the why… music is how I make sense of the world. Watching and listening to people play music helps me know them. Knowing people is what we’re supposed to do in the world – we get to know them and then we tell them they are okay, and by association that we’re okay and that together, we can do things to leave the world a better place than when we found it. That is our purpose on the earth and music is the vehicle I use to help me achieve that purpose. Learn more about Megan at www.fiddlestar.com. For information about her camps, visit www.nashvilleacousticcamps.com.